Have you ever conducted an online content audit comparing your online presence to that of your competition? I like to do so every so often, and definitely when I first start working with a client. In the pre-digital days, it's the kind of thing you could do most effectively at a trade show, when you might ask someone innocent looking to go 'fish' for competitive brochures and materials from others exhibiting. In the digital days, it's a matter of exploring your competitors' websites, and including yours in the process for a compare and contrast type exercise. Not to copy or steal what the competition is doing. Rather to learn from the exercise and better position yourself in the marketplace from the perspective of your prospective customers or personas. What I particularly like about doing an online content audit is that it's much more natural than simply obtaining copies of brochures, and I can do it myself. At least, it should be more natural. What you may discover is that your competition isn't all that comfortable being approachable and human. And, that's a really good thing! Now, what you may be thinking is that if you're considering auditing their content, what's to stop them from doing the same with yours. The answer is nothing. At the same time, it's really, really cool to discover that your competition is lurking on your site. It means they may be the kind of competitor who believes so strongly in the industry that you can jointly make it bigger and stronger. What's more likely is that your competition won't be visiting. In that case you know that it won't take much to leave them in the dust. Rather than learn from what they are doing online, you simply observe and realize that your strategy is sound. So, what's involved in figuring out how to audit content? When I audit content, I focus primarily on the content I can discover online. I definitely want to know what's available physically. When I do, I really hope that the content has been digitized in some way so it can be used online as well. (Can you tell that I like to make multiple use of everything that a business creates?) If it hasn't, well - that's a new opportunity to get it digitized so you can start sharing it online! I'm particularly interested in the online content because that's the most immediate way we have for connecting with potential customers. Good online content will show up in search results. Good online content can be shared via traditional tools such as email, or via social network links. So, by content audit I mean determining whether there's good online content to be found - whether it's yours or your competition's. If I or my client - depending on the purpose of the content audit - can't be found, I know what to do. If we can be found, I'll know what next steps are. Make sense? 1. I'll start by researching competing or related terms via the Adwords Search Tool. 2. I search through Google Analytics organic search terms. 3. I'll review my clients' top website pages to identify critical terms/keywords and related terms each page that each individual page should be focused on. 5. Again, using the Google Adwords Search Tool, I'll mine results based on the URLs of competitors. 6. Then, I'll review the websites of those competitors looking at the meta data information for their top pages to determine what comes up or not. In the process of going through this approach, I assemble a list of relevant keywords that I'll review with my client. I'll also be forming ideas for strengthening my client's website pages so they are more likely to connect with the search results of someone looking for the kind of solutions my client might offer. These will range from on-page SEO details such as titles, descriptions, images to content. If there's a business blog involved, I get very excited. And, I start developing lots of ideas for relevant blog content. Figuring out how to audit content - both yours and our comptetion's - yields lots of good information to review so you can formulate a strategy that works for getting found online, attracting visitors and converting them into customers. 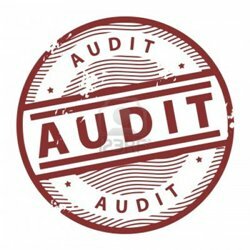 Image Credit: Grunge Rubber Stamp "Audit"